I am going to test float and almost definitely buy my new '13 PA14 this week. 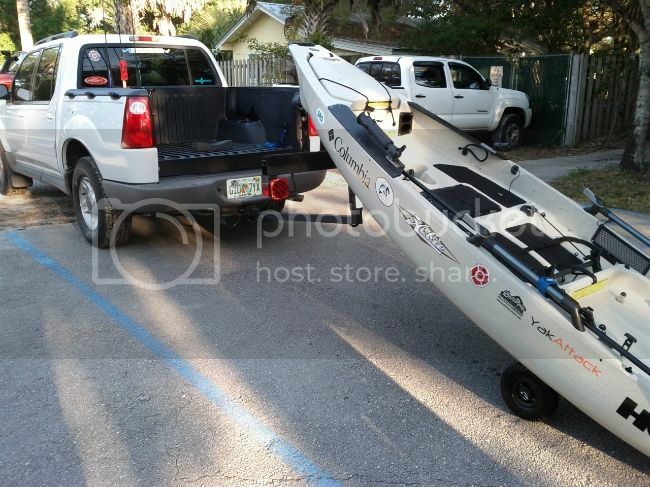 I am trying to figure out a reasonable answer to my first question: How do I haul this beast of a kayak? Trailers are obviously great, but overly expensive. I've priced truck bed rack systems and they come out almost as much as a trailer. Then there is the matter of bed space. I have a short bed Ram 1500 with a toolbox mounted on the front of it, which takes away about 18 inches of length. So now I'm looking at bed extenders. 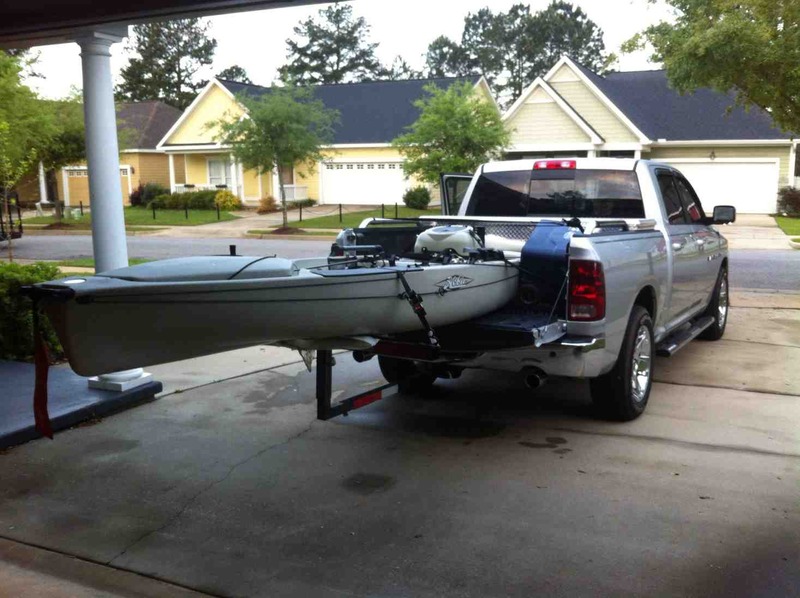 Has anyone experienced any abnormal strain on the hull by hauling in their truck bed with an extender? This is a pretty big investment to just be throwing around, so I want to be sure that I am doing things right. This is my first ever kayak, or boat for that matter, so my knowledge is fairly limited. Any help from the community is appreciated. 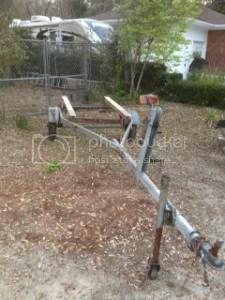 You can find an old boat trailer for little $$ and fix it up. 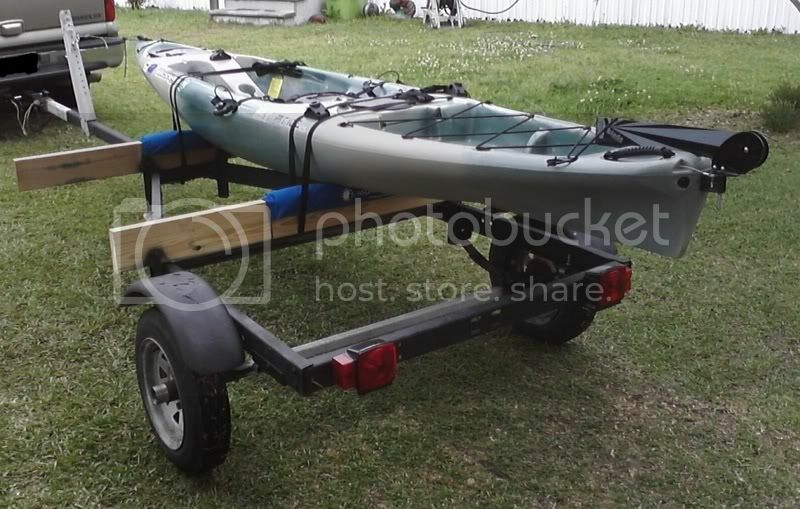 I found an old one on CL for $100, and put another $150 into fixing it up (springs, bearings, etc) and rigging it to hold a couple of kayaks, and I was good-to-go. bed extender is the easiest and cheapest way to go. been tossing PA boats around with a bed extender for a long time and dont see any issue with using one. you arent storing the boat in it, so hauling is really a non-issue. check these out. coolest ones ive seen so far. Same problem here. I'm picking up a double PWC trailer tomorrow to convert. Plan to put my boat on one side and equipment storage on the other. Much easier after a long days fishing to just back up and unhook everything. No loading and then unloading when you get home. Not sure this is the perfect system, but I'm new to this sort of fishing and in my mind it should work fine. I'll report as things go along. Thanks for the tips. It looks like I am going with the bed extender for at least the short term. I would like to have a trailer so that transport and storage are all taken care of with one item, but that will have to come a little later. Anxious to get out there! Wanted to finish up this thread with what I actually ended up doing. For my first outing, I went with the bed extender (pic below). I then found an old boat trailer for $300 that I plan on modding for my needs. It's a little bigger than I should need, but allows room for expansion. I will post before and after pics when the job is complete. Thanks to all for the tips and help. Look at the harbor freight or northern tool boat trailer. I picked one up on sail for 320.00 and added 3 " PVC and it works great. PA-14 looks good in the bed of your Ram! I've been using a Harbor Freight extender for about three years now (with many different kayaks) and I recently modified it to carry the PA-12. I removed a pair of Yakima LandShark saddles that were installed two years ago and replaced them with a boat trailer style bunk (P/T 2x4 wrapped in bunk carpet). This allows me to slide the boat on/off with ease and NO damage to hull. I carry the boat bow in/stern out so I can just roll the bow up and over the crossbar and then lift the stern, sliding the hull in far enough that I can remove the scupper cart and then slide it in the rest of the way. I use a friction strap around the crossbar (not the end loops) and another over the bow of the boat. 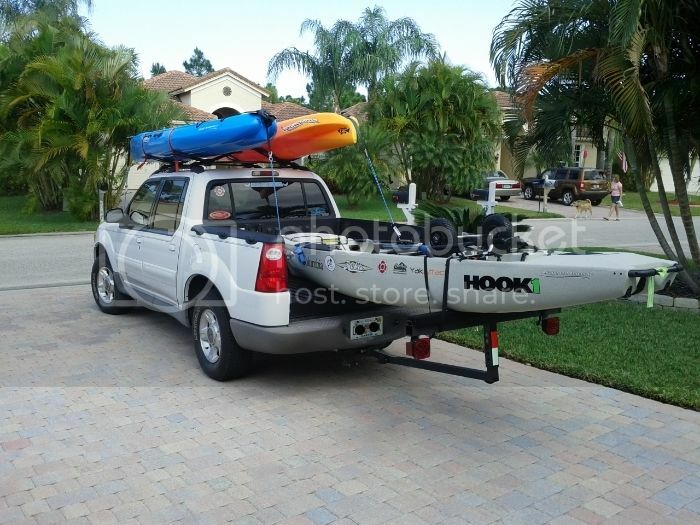 IMO, this is the easiest way to carry a single kayak/boat if you own a pick-up....simple one-man loading. BTW- I think my next extender will be the model from T-Bone. For transporting more than one kayak, I too invested in a trailer (SportsRig Micro trailer)....much easier then loading kayaks on roof & more fuel efficient! Last edited by Lt.FireDog on Mon Apr 22, 2013 7:35 am, edited 1 time in total. Thanks for the input and pics. Giving me some ideas for my extender ops while my trailer project is progressing. Off subject, I noticed you have two steering handles on your PA...have you noticed a need for that? Thanks again. You would be surprised how many people have asked that same question. ......the dealership had an extra, so we threw it on...a bit easier to use than the stock steering "disk"(? ), but not really needed or necessary IMO. Haha, roger that! Didn't think there would be much need for it unless you fished with both hands at different times. I'm a rightie, so on the left is the only place I can ever see me having the need for a steering control. Thanks again for the input.